When each year begins, I always ponder about life and how I want to do more. Then by the end of the year, once nothing has changed (because it hasn’t) I feel sad and frustrated, but I keep my head up and continue to chase my dreams no matter what the outcome is. For me, this year has had its ups and downs. If you didn’t know, my mom was hospitalized during the summer. That was a trying time, full of emotions and lots of tears. Thankfully she was a fighter and she’s still here today. Though that point in time often broke me, it made me stronger and see life differently. I saw the opportunity to grow and discover who I am and who I want to be. Then near the end of the 2014, I found a silver lining that inspires and sparks happiness in me. Because of that and other things, I actually felt content about the year ending last night. It was a good feeling! As for 2015, I declare it the year of learning. I want to learn to use Photoshop and video editing software (to hopefully post videos on YouTube). I want to take the time to learn about photography. I want to bake more often and explore my cooking skills. I want to expand as a blogger and bring more content. I’d like to travel more, if it’s possible. 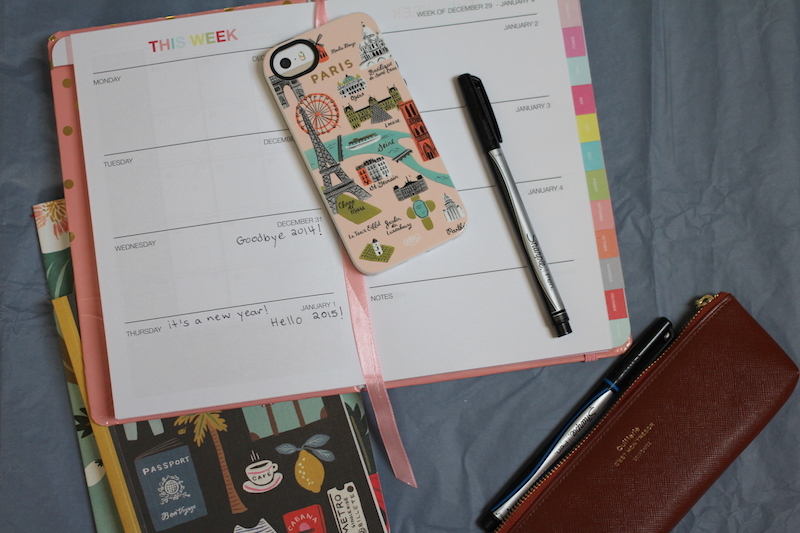 I shall use my planner to its full potential so that my day to day is more organized. Finally, I would love to make plans to enjoy life more and have some adventures. What goals and plans are you making for 2015?